Summer days are nice and long in the north country. Up here we understand that they are the solar system’s concession to us for weeks and weeks of short winter days, where we never see the sun, driving to and from work in the dark. Come June the sunlight seems to last forever. Lawn mowers running at 9:30; kids forced to bed with the sun still shining. Yet in June, while I’m trying to chase various mayfly hatches around the upper Midwest, I find myself killing those endless bright green sunny afternoons. Waiting them out. Burning an entire vacation day for a single hour of fishing. It feels like wasted time. I could be fishing all day, prospecting with an elkhair caddis, nymphing, catching small fish. But I’m not that interested in fishing just to fish, or catching trout just to do so. 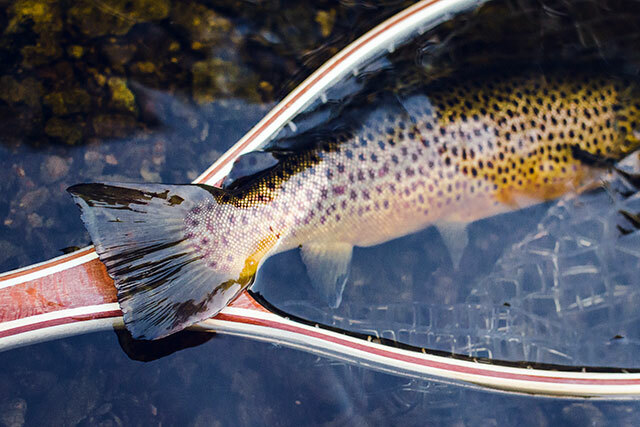 What I am interested in is matching a specific bug and casting to rising trout. So instead I kill time until the brown drakes come out at dark. Well, maybe come out. I remember the first time I wasted an entire June afternoon. A few years ago, good friend Adam and I sat on a riverbank, leaning on cedar trunks, rods leaning on the branches, killing time. The sun was sinking, draining up out of the woods. It felt unnatural. Normally we’d fish every possible moment, every square inch of river, changing flies and wading upstream until we ran out of light. Waiting for bugs was a new idea. Not our idea — we had just gleaned it from a fly shop guy who, selling us a handful of extended-body parachute brown drakes, had assumed we knew what we were doing, and let the concept slip. So we tried it, fought the urge to blind-cast and just sat there on the bank as the day waned, air cooling and light warming, river gurgling and small trout splashing in the shallows. Adam had brought along a percolator, and we built a small fire, ringed by century-old bricks we’d dug out of the soggy bankside grass and brush. Porous old bricks; not odd to find here. There are many ruined old cabins and camps along the banks. As we sat there and talked softly, we could feel the day compressing, ending, each moment more significant than the last, the coffeepot and bricks hissing with intensity as the fire grew lower and redder with the sunset. Sure, this is pleasant, but are we wasting this precious evening? And then one of the bricks exploded, a ringing crack, shooting a blaze of sparks into the air and flintlike razor brick chips skipping across the glassy river, some sailing clear into the woods on the other side, sending us scrambling for cover. We were unhurt—somehow we’d placed the one explosive brick as if it were a claymore mine, FRONT TOWARD ENEMY. No other bricks went off, but the next few minutes, putting out the fire and gathering our gear, were tense. The fishing that night was pretty good. We found rising fish eating brown drakes and we caught a few of them. I remember specifically one mid-teens brown trout that was dapped from beneath the watercress in a side-channel less than two feet wide. Those fleeting minutes of action in the twilight and the triumphant walk out through the brush in the dark—memories singed by the earlier shot of adrenaline—have stuck with me. And now here I am, on my own this weekend, killing time again—much practiced at it—sitting on a boulder as the sun hits the treetops. Guide boats begin to slip past me, headed downstream, killing their own time. Maybe annoyed to see me posted on this fishy-looking bend. Clients fan-cast attractor patterns as the guides push downstream a little too quickly for good fishing. It’s not time yet anyway. When they’ve passed the sound of the river on the rocks swallows me again and I’m alone in the world. Brown drake spinners are hard to see: if they appear, it’s right around the time that the light fails altogether, the sky turns grey-blue and grainy, and my eyes to begin see movement where none exists. For me, it’s better to just wait for a fish to rise; after all, a good spinner flight does not always end with feeding fish. But then a fish does rise. I carefully move into position. Wait for him to rise again. Try a cast. Too short is better than too long. Set the hook a heartbeat after the take. Sometimes it sticks. Hope this 6-weight is enough. It usually is. Slide him into the net. If sufficient light, take a photo. Release. Check fly and tippet. Snap water off fly with a couple sharp false casts. Wait for the next fish. The action fades with the last light; some fish sometimes continue to rise in the dark and they should be attempted. Or I should tie on a mouse and swing through a hole or two, if the wading isn’t too tough. Back at the truck for the night, waders hung and drying, a sandwich and a beer later, I am trying to fall asleep—a very efficient way to kill time—and thinking over the day. The compressed hour of fishing at the end contains so much focus and sensation that it was recorded in high definition, high frame rate — and seems like the longer part of the day. It reminds me of endless childhood summer days so packed with adventure that at age eight I was startled to realize that summer vacation was only three months long, and school nine months. I had firmly believed the opposite. The beer woke me after a couple hours. Dang. Was hoping it was morning. Mornings during brown drake season are for wasting. No urgency to get on the water early, no sense of fleeting daylight. I wonder if that cafe on the highway has that fresh lake trout breakfast special again this weekend. I hope so. Glance at my phone—in airplane mode to save battery since there’s no service in the valley anyway—daylight is still a few hours away. I turn on the truck’s dome light and crawl out of my sleeping bag and out the rear hatch and the light throws my shadow enormous along the sandy road, otherwise black in the pine forest. The silence soon resolves into the normal sounds of a nighttime river valley: barred owls and the breathless whippoorwill and multitudinous insects caroming around in the brush. Some of these notice the light in the truck and beeline toward it, glowing white. They zip past me, leaving me dizzy with the sensation of flying through a starfield at great speed. A glance upwards at the actual starfield between the treetops anchors me again. No light pollution, no highway noise; blue constellations flickering between the Norway pine boughs. All this wasted time, I think with a smile, just for a little fishing.